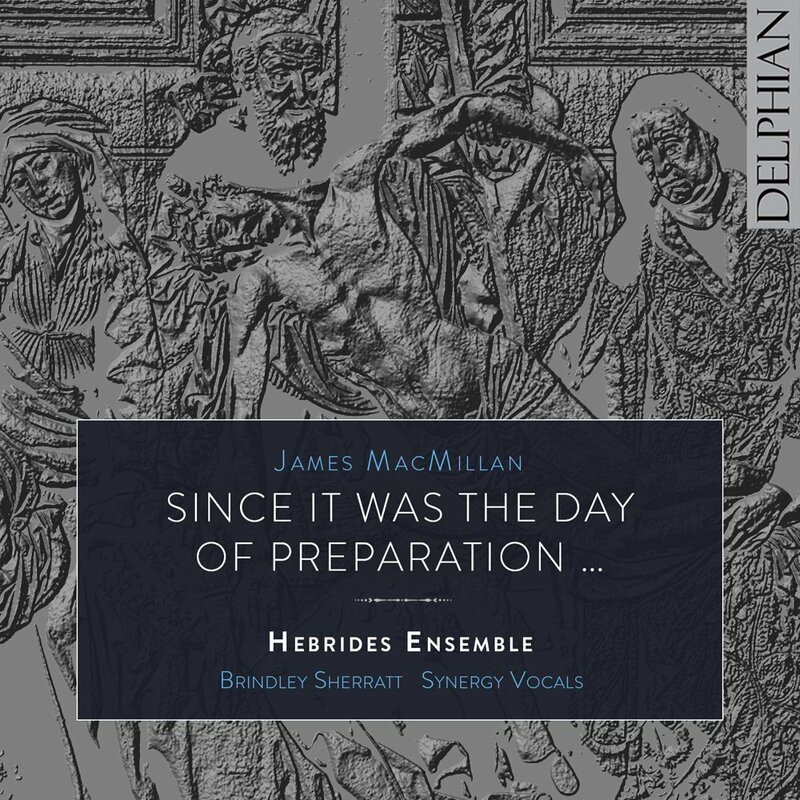 This new disc from Delphian is the first recording of James MacMillan's Since it was the day of preparation, a large-scale cantata which examines the events following Christ's crucifixion, with text taken mainly from St John's Gospel. The work is performed by the Hebrides Ensemble (director William Conway, the work's dedicatee), comprising of William Conway (cello), Yann Ghiro (clarinet), Stephen Stirling (horn), Gabriella Dall'Olio (harp) and Elizabeth Kenny (theorbo), with Synergy Vocals ( Micaela Haslam (soprano), Heather Cairncross (alto), Benedict Hymas (tenor) and Tom Bullard (baritone)) and Brindley Sherratt as Christ. The work was premiered in 2012 at the Edinburgh Festival (see the review on BachTrack) by the same performers as on the disc. The work is essential a sequel to the traditional Passion narrations and MacMillan says of the work 'On completing my St John Passion in 2007, I was immediately intrigued with the possibility of writing another work based on the text that comes immediately after the death of Christ in St John's Gospel'. (You can hear the composer talking about the work on YouTube). In fact, the title of the work comes from the first word's in St John's Gospel after Christ's death. The main text comes from St John's Gospel with the narrations taken by the members of Synergy vocals, often with two voices doing the narration and individuals standing out for the dialogue. The use of a baritone (and no bass) in the vocal quartet means that bass Brindley Sherratt really stands out in his pronouncements as Christ, bringing an otherworldly dark thrill to the music. Often dark voices represent the dark side, but here MacMillan makes Christ's music thrillingly immediate and authoritative. Woven into the texture are Latin texts, sung by members of Synergy Vocals, which complement the narrative. But this is not simply a vocal work, the members of the Hebrides Ensemble play an important role. Each of the members gets a solo moment, a movement simply described as an interlude, but which MacMillan has variously called solo motets and cadenzas. Effectively the instruments are commenting themselves on the narrative, and the first two sections each end with and instrumental quintet. Because of this extensive use of the instruments, the texture and dramatic weight of the work are rather different to a conventional passion, and the fact the instrumental line-up has theorbo and harp as its 'filling-in' instruments rather than organ also lightens the textures. The vocal writing is equally varied, of course there is MacMillan's familiar and highly evocative version of chant sung almost unaccompanied. But other moments are highly dramatic, so that the opening of part 2 dealing with the appearance of Christ to Mary Magdalene, the music is highly vivid and the two narrators (tenor and baritone) are complemented by the instruments and the other two voices to create a dramatic yet polyphonic texture which leads directly into the clarinet solo movement. But there are also blissfully radiant moments, the setting 'In albis sedens Angelus' for vocal quartet and clarinet, beautifully sets the mood for Christ's appearance to Mary Magdalene. The culmination of the piece is the final appearance, on the the Shore of Tiberias, when Christ says 'Thou art Peter and on this rock I will build my church'. A highly dramatic scena which culminates in a remarkable piece of polyphonic writing. It is tempting to say neo-Renaissance polyphony, but this isn't really neo anything, instead is masterly MacMillan using earlier forms to create something new. This leads into the final interlude, for horn, a remarkable and taxing piece of writing. The work culminates in the final quartet for Synergy Vocals, poignant, poised and profoundly beautiful, and then a final instrumental quintet. This is a long and taxing work, MacMillan's highly personal writing is profoundly effective for the forces for whom he is writing, but this does presuppose that the performers are at the peak of their game. The members of Synergy Vocals and of the Hebrides Ensemble all form superb ensembles, playing and singing with chamber finesse yet each stands out superbly when called upon. Brindley Sherratt makes a striking Christ, dark and authoritative yet sympathetic also. 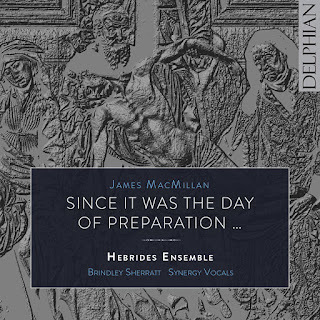 James MacMillan Since it was the day of preparation… trailer from Hebrides Ensemble on Vimeo. Recorded on 28-29 November 2015 at RSNO Centre, Glasgow.